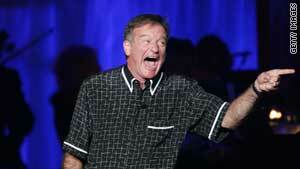 Comic improviser Robin Williams performing on stage. Improvisation is being taught at some business schools. London, England (CNN) -- In a business world that's more uncertain than ever it pays to be able to think on your feet. That's why some business schools are using improvisation classes to teach skills such as creativity and leadership. While many people might think of improvisation as unscripted comedy, it can apply to any form of spontaneous theater -- and practitioners say that using "improv" to teach business skills is no joke. Robert Kulhan is an adjunct assistant professor at Duke University's Fuqua School of Business, in North Carolina, and CEO of Business Improvisations. He has been improvising on stage for years and now teaches improvisation to business students and executives. Lakshmi Balachandra teaches Improvisational Leadership at MIT Sloan School of Management and is a guest lecturer for advanced negotiation students at Harvard Business School. She was an improv comic before working in venture capital and finance. She went to study an MBA at MIT Sloan and said it was there she realized how much she was using her improvisation training in her business career. 1) "Yes, and." Accept a situation and then deal with it. 2) Avoid asking questions. In business that means being conscious of how continually asking questions makes other people do all the work. 3) Listening. In conversation people are often planning ahead rather than really listening, and at work it's easy to be distracted by computers or blackberries. Focused listening is a crucial skill. 4) Add information. You have to contribute if you want things to go where you want them to. 5) Eye contact. In the workplace it's important to pay attention to body language. Even on the phone you can pick up clues as to how the other person feels. "Improv teaches you how to think on your feet and how to react and adapt very quickly to unexpected events and things you may not have planned for," Balachandra told CNN. "It applies to leadership and it applies to negotiation, where you never have control over what happens," she said. "Negotiation is a dynamic process -- you have to be able to think on your feet and adapt." Kulhan and Balachandra both said that the key to improvisation is the "Yes, and" principle, and it's an idea they believe is particularly relevant to business. In performance improvisation it means listening to what someone else says, accepting what they say, and then building on that. In business terms it means accepting any idea that's brought to the table and then taking that idea further. Kulhan said this kind of "suspension of judgment" is essential for brainstorming and creative thinking, but unconditional acceptance doesn't always come easily to high-flying execs. He said it's not that critical thinking isn't important -- just that it can sometimes get in the way. "There's a misconception in business that you have to be 100 percent correct 100 percent of the time, whereas the truth is you have to be 100 percent correct about 10 percent of the time -- the rest of the time you have to just make decisions," said Kulhan. "We get bogged down in analysis paralysis, or just the pressure of being right, and we feel like we have to be correct all the time. But if you just make a decision you'll have room to adapt and react and get it to work within the parameters you need." Kulhan said principles of improvisation can help anyone hone their business skills, and if you can't get to an improvisation class you can still apply the fundamentals of improv to your own life. "One way is to self audit -- see what you're doing in real time and how you affect other people in real time," he told CNN. "You can take that 'Yes, and' phrase and test it out at home or in meetings, and try exercising suspension of judgment -- try out the principles in real life."